Teaching Authors--6 Children's Authors Who Also Teach Writing: At Long Last--Tessering! What book do you wish you had read as a child? Are you kidding? I read everything as a child!! A trip to the public library was as much a part of my week as piano lessons and allergy shots. Plus, there were the biweekly class visits to the school library…and then I remembered. 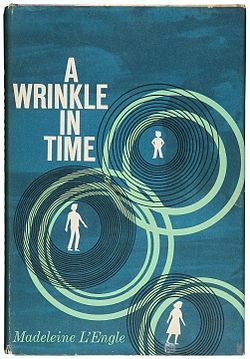 Until graduate school, I had never read Madeleine L’Engle’s A Wrinkle in Time. Simple. The one copy in the school library was always checked out. For two years I watched someone else check out the book with the cool “space age” jacket graphics. Wrinkle was the must read, IT book, for fifth and sixth graders. Madeleine L’Engle was our J.K. Rowling. The public library? It owned multiple copies….all apparently on “permanent” check out. Then I went to junior high. The librarian informed me that “Newbery books are for younger children” with a look that made me feel like a dolt for even asking. Years passed and I went to the University of Tennessee, where an MLIS in children’s services meant reading hundreds of children’s books. Their library had multiple copies of everything, including AWrinkle in Time. I’m glad that I read this as an adult. In elementary school, I would have seen a quest/adventure novel. The first line of the book is “It was a dark and stormy night.” I wouldn’t have understood the irony, but would immediately have been drawn into Meg Murry’s world. Meg sounded oddly like me (probably every girl who has read this book thinks the same thing); she has braces and glasses and no social graces. Her father has simply disappeared, apparently abandoning his family. Again, I could identify. My father, the FBI agent was gone on out-of-town assignments for months at a time. Some of the neighbors asked if I really had a father. That Meg is something of a math whiz and all the math references would have stopped me momentarily. I hated math and didn’t understand people who did. But by the time we learn this about Meg, we are already invested in her as a character, so I would’ve overlooked this character “flaw”. I know I wouldn’t have understood most of L’Engle’s literary references, and would have skipped over them. They are not essential to the basic story. Down with conformity! Up with the individual! As a writer, I know something about Madeleine L’Engle’s struggle to publish this book, her second. After 30 some rejections, L’Engle had thrown in the towel. Had her agent not sent it to just one more editor, Robert Farrar, at what is now Farrar Straus Giroux, it would never have seen the light of day. (This is a story I tell myself every time I get a rejection.) When your rejections include words like “weird” “strange” and the ever popular “unmarketable” you sort of lose hope. As a writer, I did have trouble with my suspension of disbelief from time to time. I accepted that Meg and Charles Wallace spoke like adults (because they were “different”). I was willing to believe “tessering”, even if the explanation involved math and physics (which I still don’t understand.) I couldn’t decide what Calvin’s role was in all this (Friend? lLove interest? Set up for future sequels?) I also couldn’t figure out just why Meg’s father was being held captive on Camzotz. But these are minor points in a book that has stood the test of time. 2012 marks the 50th anniversary of Wrinkle’s publication. I have not read any of the Harry Potter books (either). I wonder if kids will be as wild about Harry, fifty years hence. I think Meg Murry will be around in 2062. I didn't read "wrinkle" until I was an adult, I am not sure why, I read everything else. Possibly our library's copy was always checked out too. I am sorry I missed it though because I miss having that childhood connection to it like I do so many other classics. I, too, read "Wrinkle" as an adult...to my 10 year old daughter. I'm glad I waited - it will be an experience we will always remember. Tara you just gave me a great idea. Our family likes to read aloud...and no one (except me) has read WRINKLE. (if I hide my daughters I-phone). Mary Ann, I just re-read Wrinkle to see how L'Engle crafted the character of Charles Wallace. I first read it as a mom after my child read and loved her. Now her daughter has enjoyed the first book. It will continue to stand the test of time, I believe. Thanks for a great post. Little boxes is one my all-time favorite songs, too!